This study of prehistoric violence, homicide, and cannibalism explodes the myth that the Anasazi and other Southwest Indians were simple, peaceful farmers. Until quite recently, Southwest prehistory studies have largely missed or ignored evidence of violent competition. 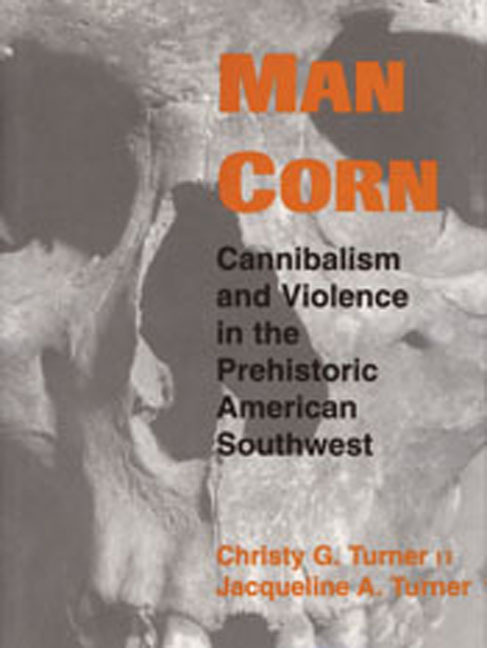 Christy and Jacqueline Turner’s study of prehistoric violence, homicide, and cannibalism explodes the myth that the Anasazi and other Southwest Indians were simple, peaceful farmers. Using detailed osteological analyses and other lines of evidence the Turners show that warfare, violence, and their concomitant horrors were as common in the ancient Southwest as anywhere else in the world. The special feature of this massively documented study is its multi-regional assessment of episodic human bones assemblages (scattered floor deposits or charnel pits) by taphonomic analysis, which considers what happens to bones from the time of death to the time of recovery. During the past thirty years, the authors and other analysts have identified a minimal perimortem taphonomic signature of burning, pot polishing, anvil abrasions, bone breakage, cut marks, and missing vertebrae that closely match the signatures of animal butchering and is frequently associated with additional evidence of violence. More than seventy-five archaeological sited containing several hundred individuals are carefully examined for the cannibalism signature. Because this signature has not been reported for any sites north of Mexico, other than those in the Southwest, the authors also present detailed comparisons with Mesoamerican skeletal collections where human sacrifice and cannibalism were known to have been practiced. The authors review several hypotheses for Southwest cannibalism: starvation, social pathology, and institutionalized violence and cannibalism. In the latter case, they present evidence for a potential Mexican connection and demonstrate that most of the known cannibalized series are located temporally and spatially near Chaco great houses. Christy G. Turner II is regents’ professor in the Department of Anthropology at Arizona State University. The late Jacqueline A. Turner was a ranch manager in Dragoon, Arizona.